A presentation at the seminar organised by the Finnish Freethinkers’ Union on the 16th of February 2008. Criticising Islam is much more difficult than criticising any other religion for obvious reason: Islamists resort to intimidation and violence almost on daily basis. Moreover, a socio-political outlook that can be called multiculturalism holds the view that we should tolerate different cultures and traditions. Naturally, indeed we should. But there definitely are many cultural traditions that are not worth of tolerating. In the corners of the triangle (see picture 1), within the ranks of those like-minded ones who agree on relevant issues, the discussion is very open and heated, but it won’t lead anywhere. The discussion isn’t constructive – the purpose is not a dialogue, but to sermon a one-sided “truth”. The centerfield of discussion is empty, except for the fashionable form of discourse that has spawned within the academic world. 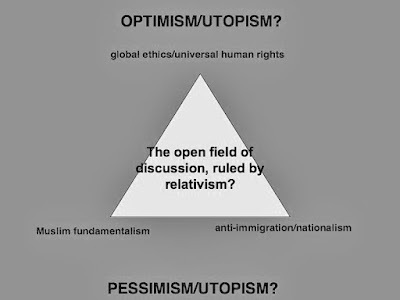 What is the role of the leftist-green, postmodernist cultural and moral relativism in the discourse on immigration and Islam? Is it perhaps in a leading role? I guess it’s safe to say that it is. My key argument is that relativistic multicultural outlook is as harmful as radical Islam itself. Dhimmitude, submitting to Islam, is political correctness that actually tries to stifle well-argued criticism of Islam while it tries to prevent fascism, xenophobia and racism. At its worst this attitude manifested itself during the Muhammad cartoon riots, when in Finland the editor-in-chief of Kaltio magazine was fired after he had published a comic strip by Ville Ranta parodying the Muhammad cartoon incident. The political leaders of Finland acted very Dhimmi-like, apologising Muslim countries for Denmark and even the Prime Minister Matti Vanhanen bent over backwards and publicly apologised the Muslim community because an independent Finnish nationalist organisation published the cartoons on their web-site. One right-wing MP called Jari Vilén even demanded police intervention, that is, the state censorship in this case! I think the phenomenon of “tolerance” of exotic “otherness” stems from the leftist-green intellectual fashion that was born in the academia in the 60s. It has good intentions and the leftwing and green human rights parties have incorporated many important values into their political agendas, but some of these issues that are connected to tolerance and human rights are currently backfiring. The leftist-green agenda has gradually spread into society at large and according to its main tenet everything evil on the face of the earth comes from the Western imperialism and capitalism. Indeed, some supporters of these postmodernist views are willing to totally relinquish the most valuable heritage of Enlightenment, all in the name of “tolerance”. In George Orwell’s famous parlance this is “transferred nationalism”, where the out-group is viewed in a light that would be instantly condemned as racist-chauvinistic-ultra-nationalistic bigotry if applied to the in-group. So there’s a clear double standard at work here. Thus it is obvious that the open field of discussion isn’t in fact open at all and we must do something about it. The leftist-green tolerance relativism is self-refuting and inevitably leads to intellectual and social totalitarianism. More to the point, if moral tolerance relativism were a valid outlook, it wouldn’t be relativistic anymore. This also applies to cultural relativism. Of course we can compare cultures and indeed we should compare them. But the rational human rights outlook is the most important as to moral standards and naturally there are many harmless cultural traditions that add to the diversity and are actually good or morally neutral regarding human diversity. But there are things that feel bad in every culture, for instance, politically motivated imprisonment, torture, genital mutilation, as well as other physical or mental abuse, like racism, discrimination and injustice. One must be quite a relativist quibbler to make these scourges appear justified from the point of view of human rights. I myself tend to think that it is impossible. My personal opinion is that relativism always leads to absolutism and thus it is in fact sheer immorality. Intellectual laziness is also deeply immoral. People have brains and they should use their capacity to reason. ”It would be foolish to deny that the prospects for American acceptance of such institutions as stoning, or flogging or amputation are virtually nil, at least for the foreseeable future". Generally we can say that the fanatical leftist-green frame of mind, nationalism and Islamism resemble each other very, very much. The road to hell is paved with good intentions. Islamic fundamentalism is just like the openly bigoted form of the nationalist white supremacy. Both are manifestations of extended tribalism. According to modern evolutionary cognitive social psychology, tribalism is a part of human nature, a central part of our evolutionary heritage. We have a built-in, instinctual – that is, “hardwired” – tendency to form in-group versus out-group distinction. However, this tendency is very context-dependent and tractable. If one should convert to Islam, she or he would immediately become a part of Muslim community, the in-group of Muslims. But at the same time, if she or he should become Shiite, she or he would be a member of out-group in respect to Sunnis. One can also be converted into nationalism, except into the race-sensitive nationalism. You can’t change your race. This feat is possible for Michael Jackson only. The leftist-green “tolerance” is very often an instantiation of the so-called inverted racism, or hidden racism, where members of “exotic” out-group are taken en masse, not as individuals. Indeed, sometimes people tend to think that it’s good that the immigrants don’t integrate in the Western societies too well, since if they did, there wouldn’t be anything exotic and exciting to tolerate! And of course you can convert into this “faith” too and, respectively, from this “faith” into nationalism. What comes around goes around. So, how could we, living in a global community and multicultural society at the same time, utilise the open field of discourse in the most efficient way? My answer to this question is that we should first get rid of easy labels like racism and far-rightwing bigotry. Moreover, we should totally get rid of relativism. I’m not sure how to implement this, but it is of utmost importance. You can criticise Islam from many points of view, but in the current atmosphere, because of the postmodernist zeitgeist, all kinds of criticism are all too easily labelled as racism, xenophobia, Islamophobia, intolerance or white supremacy. So something must be done about it very soon. Those who invoke these kinds of labels don’t seem to recognise that Muslim fundamentalism and objective Islam don’t even aim at constructive dialogue. The union of Mosque and state is as clearly anti-democratic and intolerant as nationalist bigotry and leftist-green moral relativism. On the other hand, if nationalists who criticise Islamist practises argue validly, with good points, of course we cannot dismiss their views only because they themselves represent views that are more or less inherently anti-democratic. Many nationalists are right and represent more realistic views of Muslim fundamentalism than the so-called human rights activists and leftist-green “tolerates”. So I don’t see any good reason to close the doors of discourse from the moderate nationalist in advance, quite the opposite. Indeed, one central way to tame the virulent forms of nationalism is to let the harmless forms of nationalism enter into the open field of discussion. How else could we honestly claim to be democrats? Those who take themselves as “tolerant” should indeed learn to listen to the arguments of moderate nationalists, since otherwise we face the danger of feeding the flames of virulent, bigoted nationalism and gnawing the foundations of democracy. Actually, as I mentioned above, in this regard, the leftist-green multiculturalist mentality is often as intolerant as Muslim fundamentalism and nationalist bigotry. We might ask whether liberal rationalism ultimately will be stronger than the tribalism so characteristic of our species – the form of behaviour that is instantiated by the leftist-green “above-the-law” elitism, fanatical nationalism and Muslim radicalism? Indeed these three forms of thought exploit the natural tendency of humans to form in-groups that are against the members of out-groups. They need each other, the good guys versus the bad guys. Of course the good and the bad guys are different depending on the in-group in question. No matter what, the central themes in the discourse regarding Islam are, among other things, the freedom of religion, tolerance and the respect for “otherness”. And, as I mentioned above, the Islam critics are all too easily accused of racism, intolerance and Islamophobia. But the Muhammad cartoons showed that even moderate and harmless criticism of Islam – for what could be more harmless than mere cartoons! – can cause a preposterously irrational and violent reaction in the Muslim countries and Muslim communities in the West. The case in point is the flood of death threats aimed at the cartoonists and at those human rights activists who dared to defend them. From the Western, rational and liberal point of view, this kind of behaviour is altogether intolerable in its vulgar fanaticism and outright hatred towards everything we stand for here in the West. Indeed, to counter-balance Islam, there has been born a new wave of “rightwing populism” here in Europe. Everyone remembers the case of Pim Fortuyn, a Dutch gay-politician, whose party was about to win the parliamentary election with a landslide, but who was brutally murdered by an animal rights activist Volkert van der Graaf in 2002; once again a very clear example of the leftist-green “tolerance”. Fortuyn himself refused to be labelled as a far right-winger and indeed his sexual orientation can be seen as the prime mover behind his Islam critical attitude and political views. So it’s kind of tragicomic that a supposedly “tolerant” leftist-green animal rights activist who thought that Fortuyn was a fascist of some sort murdered him. There are also Geert Wilders, another Dutch politician, and Ayaan Hirsi Ali and the late movie director Theo van Gogh (brutally murdered by a Muslim radical in 2004). Should we call these individuals far right-wingers too? I think we shouldn’t. Even the term ‘rightwing populist’ might backfire, since it is as plain as a pie that Hirsi Ali and van Gogh are not rightwing bigots and even Wilders is quite moderate and realistic in most of his views regarding Islam. At this writing, the Dutch TV channels have been refusing to show Wilders’ short TV documentary highly critical of Islam. So there’s the culture of fear at work here once again. We have resorted to blatant self-censorship here in the West and I am ashamed because of that. No ideology, religion, or anything, should be above criticism, parody or even mockery. The right to insult is a central part of freedom of speech. We should not surrender and relinquish our liberty in the face of intimidation and threats of open violence – quite the opposite. We should be adamant in defending our freedoms and rights. Ayaan Hirsi Ali has refused to assume the preconceived role of “otherness” that entails “tolerance”. She never wanted to be an emblem of the image of a helpless refugee and immigrant, living on welfare. Instead, she applied to Leiden University and was accepted. Hirsi Ali studied political history and turned into an atheist, freethinker and a paragon of Enlightenment par excellence. She became and MP in the Dutch parliament. And oh how appropriately, among the leftist-green “intelligentsia”, Hirsi Ali very soon became a scapegoat of the leftist fear of white supremacy, a black, Somali-born feminist! She in fact was even accused of being brainwashed by the imperialist-capitalist Western hegemony. This would be a bad joke, if it weren’t a scandal. Hirsi Ali is a case in point of inverted racism and hidden racism inherent in the fundamentalist version of multiculturalist dogma. She has integrated to the West so well that there’s nothing to “tolerate” anymore – that’s why she’s not tolerated at all among many so-called human rights activists, leftist-green politicians and “intellectuals”. I would like to hear some solid arguments to back up the accusations of Hirsi Ali’s rightwing bigotry. I’m one hundred percent sure there are none. Indeed we can ask if there really is the freedom of critic of religions in the West? When we take a closer look at the case of Hirsi Ali, we can ask emphatically why the so-called “tolerant” people don’t want to listen to this human rights activist who defends the rights of women and sexual minorities under Islam? Irshad Manji, a Canadian liberal, reform-minded Muslim, now directing the Moral Courage Project in the New York University, is an interesting figure as to the criticism of Islam. Is Manji the dream-come-true of the “tolerates” – or their nightmare? It is quite impossible to categorise Manji as anything the Western “human rights activists” and Leftist-green “intellectuals” could or should, according to their own dogma, “tolerate”, since she’s openly lesbian and as Western as can be, but at the same time one of the world’s most outspoken critics of Islamic radicalism. So, can Manji – a devout Muslim herself – be accused of “Islamophobia”? Indeed, one may ask, can even Manji, according to the standard paradigm of “tolerant” multiculturalism, criticise radical Islam without committing the thought-crime of defamation of Islam, the religion we ipso facto should “tolerate” because it represents the exotic “otherness”? So, if there’s a problem with Manji’s Islam critique, should we call her too a rightwing bigot? If so, why? As I already mentioned, Manji is a liberal human rights activist. But at least here in Finland the leftist-green “tolerant” people silence her to death. Why? What’s the matter here? In her book The Trouble with Islam Today (2003) and in her more recent documentary Faith Without Fear Manji argues that a radical reform in Islam is necessary. She wants to launch Project Ijtihad, the revival of Islam’s lost tradition of freethinking. I fully agree with Manji and strongly support Project Ijtihad. So I just can’t help wondering why on earth the Finnish “tolerates” don’t want to help her in her cause, but instead practically ignore her totally; this despite the fact that Manji also works for the European Foundation For Democracy and has been asked an expert advice regarding the integration of Muslim immigrants in France. Manji’s book has also been translated into Finnish already in 2004, but probably because of her vehement critique of Islam’s brutal practises and human rights violations, the Finnish “tolerates” tend to think of her as a problem! What gives me confidence in respect of reason and the future of freethinking in Europe is the fact that the French government recently offered to protect the Muslim dissidents and those who have relinquished Islam. This is definitely the right direction for Europe. One integral factor in this process has been Irshad Manji’s dazzling moral courage to take a stand against the injustice practised in the name of her own religion. I would like to return to the case of Geert Wilders, an ex-liberal Dutch MP, who has been labelled as a rightwing bigot and “Islamophobe”. But is there really a single valid argument to back up these accusations? I remember seeing a BBC Hard Talk interview with Wilders shortly after the Muhammad cartoon riots and the interviewer tried to accuse him of racism and xenophobia. But in my opinion, nothing whatsoever Wilders said had anything to do with xenophobia or racism. He actually defended the “Judeo-Christian” tradition of Europe and used it as a comparison to the Medieval Islamist theology and daily practises. However, I tend to think what he really was talking about were the key values of Enlightenment. Wilders indeed strongly defended human rights and the freedom of speech an in my opinion the interviewer made fun of himself attacking Wilders for some of his opinions regarding the safety of Dutch citizens. These were issues about the anti-terrorism and police operations. I would like to ask whether Wilders really is a “far-rightwing bigot”, and if so, what should we say if an openly fascist and racist political force were to surface in Europe? How should we call that force – a far-far rightwing bigotry? I think the catchphrase ‘far-rightwing bigot’ has been overused to the extent that it has lost most of it original meaning. Everyone not representing the leftist-green “tolerance” is all too easily labelled as a far-rightwing bigot nowadays. Actually, there has been a total change in the political division between the left and right wing. Nowadays we can see many telltale signs that the leftists in fact support conservative forces in Islamic countries and within the Western democracies – they even openly defend radical, militant Islamist organisations such as Hamas and Hizbollah – and the right-wingers, in many cases, are progressives in the old leftist sense of the word. In the postmodern world, in the case of Islam, it is the right-wingers who speak for human rights and individual freedoms. How strange – and Orwellian. We, as rational freethinkers, just cannot accept this and surrender in the face of double standards and intellectual dishonesty. As supporters of universal human rights and global ethics we must not accept the violations of human rights anywhere. If someone wants to justify morally outrageous behaviour with the tenets of any religion, we must take this individual to task and ask for arguments, not dogmas from the so-called Holy Scriptures. There is absolutely no excuse for immoral behaviour and history has given us more than enough proof that religions and religion-like ideologies have caused and still cause the most preposterous human rights violations on the face of the earth. Of course there’s the question of ultimate motivation, but we simply cannot deny that religious dogmas play a major role in many intolerant and inhuman practises. My honest opinion is that precisely Ayaan Hirsi Ali and Irshad Manji and their ilk are brilliant examples of working multiculturalism. We should use them as role models for young Muslims whose parents or grandparents have immigrated to Europe and who face the dilemma of living in two different cultures at the same time. Manji is a living proof that you can be a devout Muslim and a liberal freethinker at the same time and Hirsi Ali shows what uncompromising courage and spirit really are. I think the world needs much more intellectually honest human rights activists such as Manji and Hirsi Ali and how sad that in Finland both are practically silenced to death – at least in the leftist-green circles. I say we should listen to all parties involved and utilize the field of discussion maximally. We should respect our opponents and, on the other hand, not be afraid to challenge the views and practises that clearly violate human rights and freedoms. If we remain silent in these cases, we become accomplices to injustice. This is inverted racism and moral relativism. Many leftist-green “tolerates” just don’t realize this. Yet. The most important things in harnessing the virulent strains of Islam are the propagation of knowledge about Islam and its traditions, and, on the other hand, schooling and education. We should teach children knowledge about religions, not religion. The relationship of schools and homes is in a key role in this, as well as legislation. In Finland and also in the West as a whole, we should separate the church and the state and renovate the schooling and education system regarding religion. Of course the question of how strongly the state should be able to intervene in the religious indoctrination practised in home – subtly, as a cultural tradition, or strongly, in the case of fundamentalism – is a very difficult one. I won’t go into that here. I would like to end this essay by mentioning a recent book The Suicide of Reason - Radical Islam's Threat to the West (2007) by Lee Harris. The author might be somewhat simplistic in his views, but his main thesis is quite convincing. To sum it up, Harris argues that in the Muslim culture fanaticism is admired and respected, whereas in the liberal West we denounce and disapprove it. Because of this, the fanatical side inevitably gains advantage and gets the upper hand. Western liberalism isn’t self evident but a historical contingent phenomenon, always at risk of driving itself to extinction. But the positive upbeat in Harris’ exposition is the fact that if and when we in the liberal West acknowledge and recognise this difference in outlook, we can prevent the “suicide of reason” and save our precious liberal democracy. Edellisessä blogikirjoituksessa mainitut Hamasin veikeät lastenohjelmat jatkuvat edelleen. Helsingin Sanomat uutisoi, että nyt lapsia aivopestään tappamaan George W. Bush ja tekemään Valkoisesta talosta moskeija. Tästä jokainen voi päätellä, sopiiko ääri-islam demokratian kanssa yhteen vai ei.